Product descriptionAT-MINI-10 Bbiological indicator incubator is the biological indicator for supporting equipment, small size, light weight is suitable for pressure steam sterilizer biological indicator biological indicator for ethylene oxide sterilization and other biological indicator sterilization effect detection and cultivation. 1Unique design, small size, light weight, convenient movement, suitable for all occasions. 2LCD display, temperature and time display simultaneously. 3Automatically fault detection and buzzer alarm, temperature calibration function. 524V DC power supply input, low power consumption, built-in over-temperature protection device, safeand reliable. 6A variety of standard sample blocks for your choice, convenient replacement, the hole of block can be customized according to the size of tubes. 1Unique and novel appearance, small size, powerful functions. All surface that contact with water adopt stainless steel material and PC material, with strong corrosion resistance. 2Using a once punch-formed stainless steel inner liner, with unique sealing structure to eradicate water leakage; Three groups of water tanks postposition independent drain valves separately, can easily emptying the sewage after clean the Inner container. 3Using microcomputer program PID automatic temperature control, uniform temperature control, high precision. 4Built-in water level sensor, to prevent the hidden dangers of dry burning, safe and reliable. 5Dual digital tube digital holographic display temperature and timing time, parameter display is accurate and intuitionistic, with beep alarm prompt function. 1. Speed adjustable. Gentle shaking, applied in different industries. 2. LED display time and speed. 3. Compact and clean designed, streamlined fuselage, simple operation, convenient for cleaning. 4. Timing function. Beep alarm when operation ends. 5. DC brushless motor, safe, long life and free of maintenance. Operating silent and stable. Product descriptionAT-MIN-25 micro-plate centrifuge is a unique mini instantaneous centrifuge which is special designed for the 96-hole micro plates.It can quickly spin down droplets and condensation. It is used before and after thermal cycling to improve PCR yield. Put the micro plate from the slots of the top vertically (leakage for liquid will be kept in the micro plate under the action of surface tension), the spin-down work is easily finished. Two operation modes humanized configured - short mix and time setting operation, makes the experiment more convenient and efficient..
1Wide applicable range. It suit for skirted, semi-skirted, non-skirted and all standard PCR plates. 2Strong centrifugal power. Accelerate to 2500rpm quickly. From top speed to stop cost around 10seconds. 3Using DC brushless motor. Free of maintenance. Working stable and quietly. 4Humanized design. Two modes - pressing for operating and setting time for operating - makethe experiments more convenient and efficient. 5Smart size, simple operation. The cover can be fully opened to 95 Degree, convenient to put andfetch the plates. Product description Micro plate shaker AT -MIX-150 is mainly applied in solution mixing and shaking with PCR plate (96-holes/384-holes), cell culture plate (24-holes/48-holes/96-holes etc.) for immunoassay and dyeing experiments. 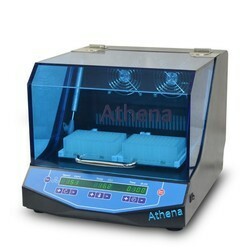 It is safe used in low temperature environment or low temperature incubator. AT -MIX-150 is designed compact with simple and convenient operation. It uses DC brushless motor, safe, stable and no noise. 1. LED digital display. Simple and easy operation designed panel. Display time and speed accurately. 2. Microprocessor controls speed and time, safe, stable, no noise. 3. 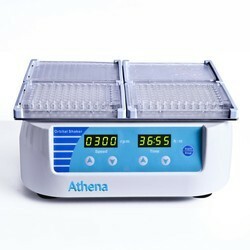 Accommodate 4 standard PCR plates or micro plates, mixing trace amount of sample efficiently. 4. DC brushless motor, long life and free of maintenance. Provide both gentle and powerful shaking. 5. Provide timing function. Alarm notification when program completes. 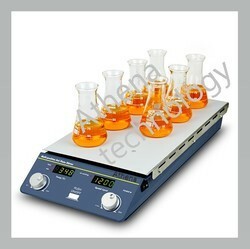 Product description AT-MS-50series Multi-position Magnetic Stirrer is designed for the high-efficiency experiments and has 4/8/12 stirring bar configurations to choose. It can use laboratory space efficiently. DC brushless motor makes the model, low speed but stable, high speed but powerful with low noise. Stainless steel is coated by silicone resin film disk. Non-slip and anti-corrosion. 1. Digital display stirring speed at real-time , stir bar operate synchronously and provide uniform agitation reaction conditions. 2. 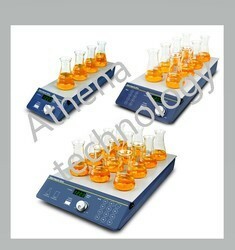 Efficient multi-position magnetic stirrer configure 4/8/12 stirring positions to use lab space effective. 3. DC brushless motor. Low speed but stable, high speed but powerful. Low noise and free maintenance. 4. Stainless steel is coated by silicone resin film disk. Non-slip and anti-corrosion. 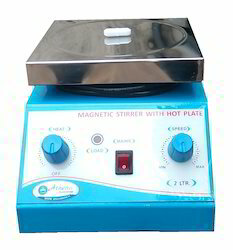 We are a coveted provider of optimum quality Magnetic Stirrer With Hot Plate. This stirrer finds extensive use in lab areas. 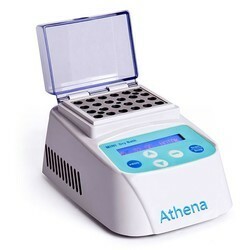 This stirrer comes with support of hot plate, pipette controller, pipette pump and other functional supports so as to ensure efficient and consistent working performance. The provided stirrer is manufactured using the best quality components with the aid of innovative methodology. The offered stirrer is also inspected against several measures of quality in tune with industry standards and norms to eliminate any kind of defect. 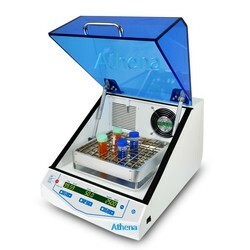 Product descriptionThe Micro-Plate incubator shaker AT-ES-6E is one temperature controlled biochemical instrument combined incubation and shaking function. It is widely used in cell culture, fermentation, hybridization, biochemistry, research of enzyme and cell tissue, etc. 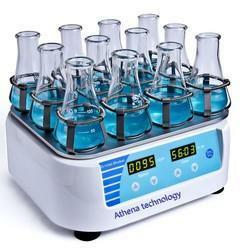 which required higher quality of temperature controlling and shaking speed. It can dynamically and statically cultivate microbial cell and all kinds of strains. 1. Integrate incubator and shaker. Save laboratory space. 2. Rational and compact designed, good temperature uniformity, low noisy. 3. Micro-processor controls temperature and shaking speed. Timing function built in. 4. Design of Human-machine interface and operation panel. Cover can be wide-angle opened, convenient to watch and fetch the sample. 5. Built-in cover switch. When the cover is open, air circulation, heating and shaking will automatically stop. Notemperature overshoot problem. 6. Unique speed control circuit to ensure shaker smooth starting and avoid liquid spilling. 7. Speed of the circulation fan is adjustable to avoid high-speed of the circulation fan making the sample volatilizing. 8. Independent temperature alarm system. Heating is cut off when temperature over the limited value. 9. Alarm when program completes. 10. Brushless DC motor, long life and maintenance free. 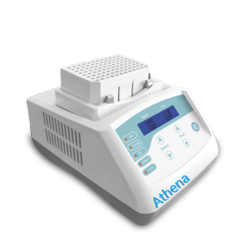 Product descriptionATIS-60C Incubator Shaker is one kind of temperature controlled biochemical instrument combining incubation and shaking function. It is widely used in cell culture, fermentation, hybridization, biochemistry, research of enzyme and cell tissue, etc. which requires higher quality of temperature controlling and shaking speed. It can dynamically and statically cultivate microbial cell and all kinds of strains. 1. Integrate incubator and shaker. Save lab space. 2. Compact design, good temperature uniformity, low noise. 3. Micro-processor controls temperature and shaking speed. Built-in timing function . 4. Friendly equipped with touch screen and operation panel. Cover can be widely angle opened, convenient to watch and pick sample. 5. Equipped with cover switch. When the cover is open, air circulation, heating and shaking will automatically stop. No temperature overshoot problem. 6. Unique speed control circuit to ensure shaker smoothly start to avoid liquid spilling. 7. Circulation fan speed can be adjusted to avoid high-speed of the circulation fan making the sample volatilize. 8. Independent temperature alarm system. Heating is cut off automatically when temperature is over the limited value. 9. Sound alarms after program finishes. 10. Brushless DC motor, long life and maintenance-free. product descriptionAT-MIX-30 smart is a compact mixer with a high efficiency, multiple functions. It integrates design principle of mixing and shaking with intelligent operation and can be applied to a variety of mixing and vortex shaking operation. It not only can mix various micro volume tube, PCR plate, deep hole plate and micro plate and other common laboratory supplies ,but also equips the function of votexing all kinds of tubes. 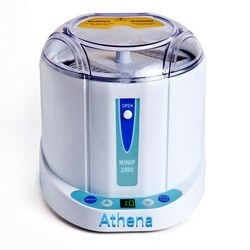 Unique design principle, which combines mixing and shaking with intelligent operation make the operation simpler, safe, and convenient. The excellent radius and dimensional technology blend in with adjustable mixing speed ensure fast and perfect experiment. Product descriptionThe Dancing Fairy -Vortexer Smart focus on touch-to-mix (short mix) for a variety of tubes / centrifugal tubes. Its compact design makes it very attractive and welcome, while its touch-to-mix operation makes it very easy handling and quite convenient. Dancing Fairy -Vortexer Smart becomes an essential experimental instrument with its prominent mixing effect. 1. The maximum diameter of the mixed tube is up to 30mm. Suit for mixing tubes / centrifugal tubes with prominent mixing effect. 2. Outer shell and touch concave are made of plastic which is resistance to chemical attack. The thick base makes operation very steady and reliable. 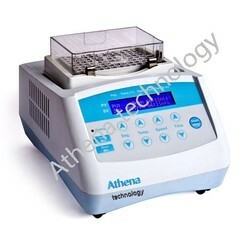 MTH-100 Thermo Shaker Incubator (Heating)is themo shaker incubator with fast mixing speed and integrates three function mixing, shaking and heating function. Combined with intelligent operation design, it not only can mix various micro volume tube, PCR plate, deep hole plate and micro plate and other common laboratory supplies, but also equipped he function of votexing and heating all kinds of tubes. It can meet the needs of different users. 1. Perfect radius and excellent dimensional technology blend with adjustable mixing speed. 2. Programmable. Efficient shaking and temperature control. 4. Microprocessor controlled incubator. Good linearity of temperature control. Precise control of the shaking speed. 5. Timing function. Time range is from 0 to 100hours. 6. Various blocks to exchange, convenient for replacement. 7. Built-in temperature calibration function and short mixing function. 8. DC brushless motor drive, long life and free of maintenance. 9. Multiple safety protection function. Conform to CE safety standards, safe and reliable. 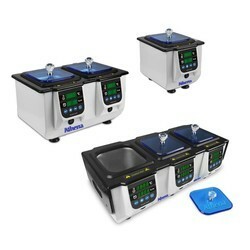 Looking for Shakers Incubators Vortexes Stirrer ?